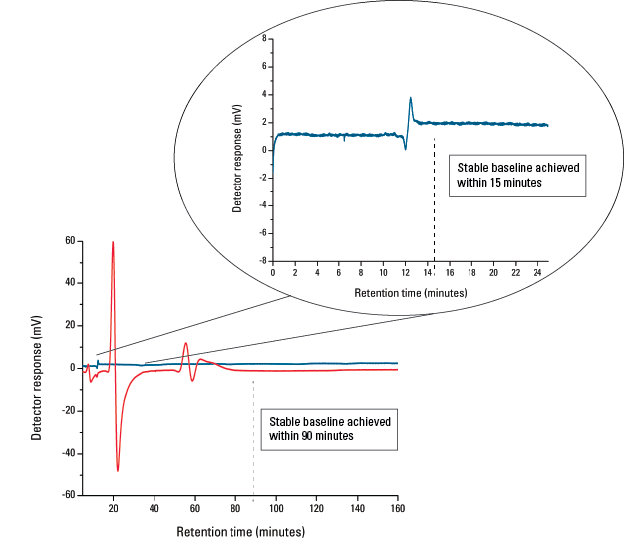 On the EcoSEC GPC System the RI baseline is considered stabilized when the drift in signal is 1x10-7 RIU/h or less (based on THF at a flow rate of 1.0 mL/min). When a new set of columns is manually placed on the EcoSEC GPC System and the flow rate is started, the RI baseline stabilizes after 80 - 90 minutes. When a new column set is brought online using the column switching valve, the baseline stabilizes after 15 minutes. (Experimental conditions: THF, 35 °C, 0.35 mL/min, 20 min warm-up at 50% flow rate). The figure below clearly demonstrates the 65 - 75 minute savings in time required to reach a stable baseline when the columns are switched using the column switching valve compared to manually changing columns.